It’s a compact and portable drone that normally require a two man crew, equipped with a 4K camera. It’s a great drone for indoor flights. It provides a rocksolid HD video downlink on an 10 inches monitor. 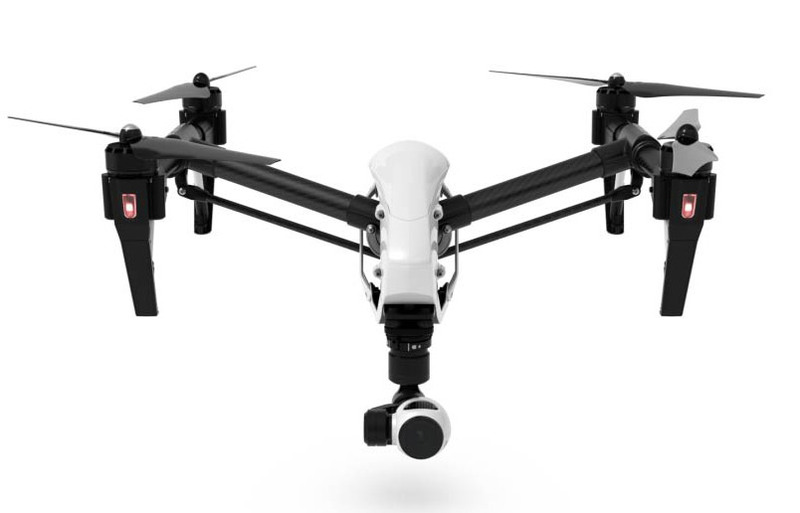 The Inspire 1 Camera shoots 4K video at 24p and 30p, and it can shoot HD video frame rates from 24p to 60p. It features a 1/2.3″ CMOS sensor with a 94-degree field of view (FOV) lens. This field of view works out to about 20mm in 35mm equivalent, which gives you a wide but not extremely wide or fisheye framing – while not as immersive as a fisheye, this FOV features less distortion and gives the subject more emphasis. In addition to video, the camera is capable shooting up to 12MP still photos using JPEG or non-proprietary DNG RAW format. The three axes of the gimbal give you pan and tilt control, and keep the horizon line level even as the aircraft banks. Different gimbal settings allow the camera to lock onto a fixed subject, be moved manually using transmitter rotaries or the app, or to simply provide camera stabilization. It’s normally a two man configuration: one operator can pilot and another can pan and tilt the camera. View a live 720p HD image with the free Pilot mobile for Android or iOS mobile device. The app also enables full camera control, letting us set parameters such as camera tilt, ISO, shutter speed, white balance as well as set video start/stop and take photos. The mobile device tethers to the transmitter via USB (cable available separately). A wireless range of up to 1.2 miles line-of-sight is provided (depending on conditions).